NWDA Recruitment 2019: The National Water Development Agency is an Autonomous Organisation Which, invites online applications from Indian Citizens for filling up the vacancies of Junior Engineers, Junior Accountants, Stenographers Grade-II and Lower Division Clerks on direct recruitment basis. Totally 73 vacancies are allotted for above positions. Applicants who are seeking Central Government Jobs can use this Great Opportunity. Eligible Candidates can apply through Online till the last date (i.e) 22nd February 2019. Here you can find more information about NWDA Recruitment 2019. Applicants who have completed their Diploma in Civil Engineering or equivalent from a recognized University or equivalent are eligible to apply for National Water Development Agency Jobs 2019. Well, the NWDA allows the candidates to apply for Junior Engineers posts through Online. So, We have listed here complete eligibility criteria of NWDA Recruitment 2019 along with Online Application Links. So, Applicants are advised to make use of this article and apply for National Water Development Agency Recruitment 2019 before the last date. Aspirants those who are looking for National Water Development Agency (NWDA) Jobs have to attain certain Qualifications. 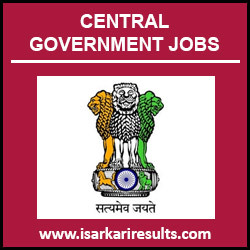 Candidates should possess at least 3 years experience in handling commercial accounts independently and capable of preparing final accounts and Experience in finance/audit departments of Central/State Govt./Autonomous bodies. Applicants should have Knowledge of Computer operating system, computer peripherals etc. Here Applicants can check the eligibility details like educational Qualification, Age Limit, Application fee, Official Notification. So, Applicants are advised to make use of this article and apply for NWDA Recruitment 2019 before the last date. 12th Standard- Matriculation / Diploma in Engineering/ Degree in Engineering/ Graduate/Equivalent Examination passed from any Govt. recognized Board. Candidates must have below given Age limit for Junior Engineers NWDA Jobs 2019. Age relaxations will be considered as per the rules of NWDA Recruitment Board. Candidates can apply through Online, Here, we will be providing direct links to the online application form to make ease of Candidates. Candidates are required to apply online only by using the website www.nwda.gov.in. The last date of submission of online applications is 22nd February 2019. Candidates are advised to furnish correct information and should not provide any documents/information that is false, tampered, fabricated or should not suppress any material information while filling up the “on-line” application. Along with the application form we also listed steps to apply for NWDA Careers 2019-20. So make use of this article and apply for National Water Development Agency 2019. The National Water Development Agency (NWDA), has set up in July 1982 as Autonomous Society under the societies registration act 1860, to carry out the water balance and other studies on a scientific and realistic basis for optimum utilization of water resources of the Peninsular river system for preparation of feasibility reports and thus to give concrete shape to Peninsular river development component of National perspective plan prepared by Central Water Commission and the then Ministry of Irrigation. In the year 1990, National Water Development Agency is also entrusted with the task of Himalayan Component of National Perspective Plan. In 2006, it was decided that NWDA will explore the feasibility of intra-states links and to take up the work for preparation of Detailed Project Report of river link proposals under National Perspective Plan.